Seth Apter was first up and I really enjoyed his stencil techniques. After class I visited Ephemera. Wow, what a great place full of vintage stuff and and Ephemera (of course). Stamps, paints, all kinds of supplies. I had to have some of the supplies Seth demoed and there they were! That night was the opening reception. Meeting, greeting, food, wine and mini demos. I don’t have the room but many posts showed it. It looked like a party for sure. Carolyn Dube had a post showing the room. Boy, couldn’t have been more perfect for her muse! This is some of us on the patio. Enjoying the time together. Me, Patty, Lisa and Sherry. Next up were the classes, so much fun. First for my group was Pam Carriker and Mary Beth Shaw. All four teachers, Seth, Mary Beth Traci, Pam. Two of Pams Journal pages I believe. Below is my piece from Pams class. We got to try Pams paints which are wonderful. If you have a chance to try, get them. I love the turquoise and mustard seed used in my journal. The colors are amazing. Mary Beth’s class was experimenting and new techniques they still need some more but look at how cool they look. 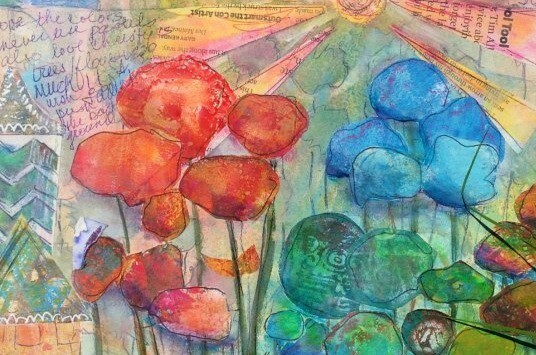 Gelli printed are a fave for me and I love the blue partial print. I loved using the fluorescent paints. I was not as brave as Mary Beth. Day 2 was Seth and Traci. I learned so much from Seth about texture, making rust and bringing it together. My piece uses some words thay are hard to read but say “the seat of the soul” and the other says “all together” I added a little journaling at the end. That is my roommate sitting to Seths right. Also Kiala Givehand and several others. In Traci’s class it was about mark making, loosening up and transfers. Wait till you see Traci’s new stencils! Can’t wait. I realize I didn’t tal pictures at Ephemera except the classrooms. If you have any please post in comments. Valorie from Ephemera even picked me up at the airport. I love Paducah! Whar a weekend it was. Take a class there if you can. They even provided lunches. I know I am forgetting some stuff but for now I have a journal to play in. I’m glad you you were able to go. It looks like so much fun. Great teachers and you did beautiful work. Great to make new friends. Maybe I’ll join you next time. So happy to meet you there for a super-creative weekend!! Oh yes I loved meeting you too. I wish I had been able to spend more time with you. I also love when you and Mary Beth journal together. Hope ew do it again!